Here’s the thing: I’m a word person. To make it on my favorite books list, you have to write something that captures me with your words. In addition to writing a colorful story with in-depth characters and connection, I love quotes that stand out to me. I really like being able to see your words splashed allover the internet on tumblr posts and artistic banners for blogs. I need characters to say profound things that touch my soul. I want you to make me think, learn, question. To me, personally, that’s what makes a good book. 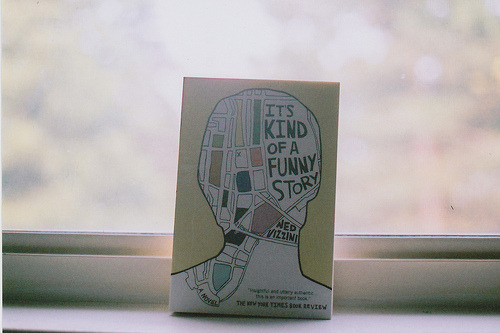 Unfortunately, It’s Kind of a Funny Story by Ned Vizzini didn’t do much for me. I had no expectations for this book. At first glance, I learned it was a story about a high school boy who suffered with depression. Doesn’t sound too bad, right? It could have some interesting insight, right? Wrong. (I should probably stop assuming things). What bothered me most was the structure. The flow of the story is written more like a film script. Throughout, it is difficult to understand the dialogue/which characters are speaking. In the very beginning, there were few descriptive clues about Craig’s friends. There’s a scene where they’re all hanging out together, talking back and forth and we cannot visualize who is saying what. In the hospital, Craig is introduced to various patients and it’s hard to grasp an image of them. As he interacts with them throughout the book, I found it difficult deciphering who was who. Another big frustration was lack of character development. I understand if you want to leave some things up to the reader to decide, but if you want me to connect with these characters and their struggles, I need a little more than surface knowledge. Now, maybe Vizzini intended for us to only get snippets of these characters- but I felt no connection to them. If they had all died in some kind of crazy hospital fire, I wouldn’t have felt any remorse. The most connection I felt was towards Noelle- and I still don’t really understand what happened to her besides the fact that school stressed her out. That leads me to my third main frustration: Craig’s point of view. I just didn’t like it. I didn’t like being in the mind of a teenage boy’s mind. I didn’t like his obsessive thoughts about Nia. And overall, I didn’t understand him. I probably would have liked a story told from Sarah’s (Craig’s little sister) point of view better. It sounds like Craig was fine until he got stressed out- due to his new high school. So he spends 5 days getting help, and comes out of the hospital magically better… with a girlfriend. So girlfriends solve your depression? Meh. That’s what I learned from the book, anyway. I’ll stop my rant there. So, seeing as this was our May book club read, we decided to watch the movie instead of try to discuss the nonsense. Guys, the movie is a lot better. Yeah. I just said a movie is better than its book. I mean, it is not the best film in the world- but it’s humorous and does a nice job of setting up the plot and characters. Some things were cut out, but I was really okay with what they did. So if you’d like to save yourself some time, just go watch the movie. That’s all for this Thursday! Thanks for reading.